Prague-based design team Zorya is using natural crystals to grow an opulent chandelier for Germany’s Pillnitz Palace. 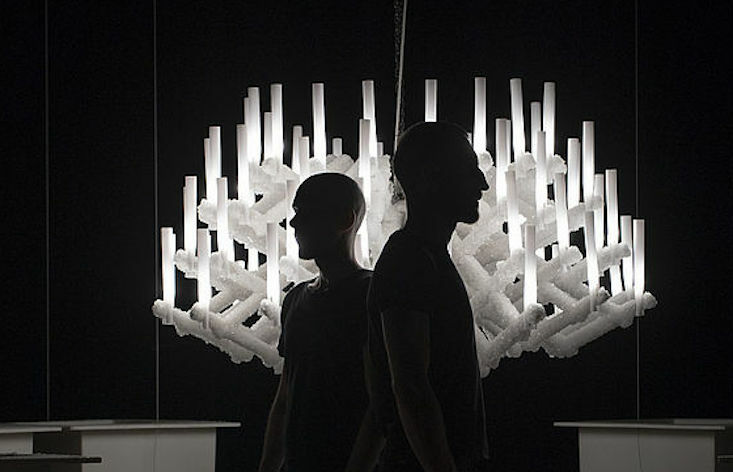 Zdeněk Vacek and Daniel Pošta grew the 18-armed chandelier at the luxurious 14th century residence in three weeks. The pair are already well-known for their crystalline experiments, which they use to create jewellery. It forms the centerpiece of a new project with the Museum of Decorative Arts in Dresden, which operates one of its branches in the palace. The exhibition, From Dust to Glitter or How a Crystal Chandelier Grows, also features a short film directed by Milan Chadima that documents the project. The chandelier will become part of the museum's permanent collection when the show closes on 4 November.